The prevalence of non-communicable disease like Type 2 diabetes mellitus is increasing among woman. The study is aimed at investigating the prevalence of Type 2 Diabetes Mellitus and their associated risk factors among woman, in the states of Andhra Pradesh and Telangana of India.The present study is the part of case control study of Genetic and Non-genetic risk factors for Type 2 Diabetes Mellitus and its related complications. Validation of the single nucleotide polymorphisms in Calpain10 and Adiponectin genes with proven role in predicting Type 2 Diabetes Mellitus in woman in comparison with the men among the discrete diabetic population under the study. The biochemical parameters were also compared. The study was conducted among a total of 180 subjects (96 females and 84 males) out of these, 90 were diabetic cases (54 females and 36 males) and 90 were controls (42 females and 48 males).All these subjects were used for non-genetic risk factor study. Only 41 diabetic cases (28 females and 13 males) and 10 controls were used for the Single Nucleotide Polymorphism (SNP) study. On measurement of the blood glucose levels (Fasting and Post prandial blood glucose), it was found that the prevalence of diabetes was more among the women than in men. The mean± standard deviation value was found to be high in diabetic subjects (both women and men) in comparison to the normal ones. The Lipid concentrations were found to be high in all diabetic cases and some controls showing their susceptibility for Type 2 diabetes Mellitus in future. Only HDL showed low concentrations. The SNP rs2975760 of CAPN 10 gene is present in 50% of the diabetic women studied where as it is present in 46.1% of the diabetic men. Similarly the SNP rs3792267 of CAPN 10 gene is present in 58.5% of the diabetic women population whereas this SNP is present in 30.7% of diabetic men.The SNP rs3774261 of ADIPOQ gene is present in 42.8% of the women population and whereas this SNP is present in 38.4% of diabetic men.A new SNP was identified in new position of CAPN 10 gene and was found in 39.2% of diabetic women whereas it was found in 15.3% of the men population. Type 2 diabetes mellitus, Andhra Pradesh, Telangana, Calpain10 (CAPN10), Adiponectin (ADIPOQ), Single nucleotide polymorphism (SNP). Type 2 Diabetes Mellitus has become a global health issue . T2DM is a condition characterized by elevated blood sugar levels. This condition is due to either insulin resistance or absolute or partial deficiency of insulin secretion by the pancreatic β-cell [2-4].The number of people affected with diabetes is projected to be 438 million by the year 2030 . Prolonged period of diabetes increases the risk for other complications. The frequency is increasing many folds especially in south Asian population due to high genetic and non-genetic risk factors . Diabetes has significant effect on adult population [7-10]. The risk for death is twice in people with diabetes when compared to normal persons . The women with diabetes stand for the second highest mortality in South Asians . Approximately 9% of the South East Asia women were diabetic in 2008 and 10% were of 25 years age. The more prevalence of diabetes among women in the developed and developing countries is attributed to more of the body fat and the increased lipid profile. About 55% women deaths occur due to diabetes . The ninth leading cause of death among women is diabetes which accounts for approximately 2.1 million women deaths worldwide compared to 1.8 million deaths in men . The life span decreases by 8.2 years among diabetic women and by 7.5 years among diabetic men on average than those who don't have the disease. Risk of heart disease increases six times in diabetic women when compared to normal woman. The major risk factors contributing to diabetes are Biochemical, environmental and genetic factors [14-16]. All of them together or independently are responsible for the development and advancement of the disease. This is because of lipid abnormalities characterized by increase in the Triglycerides, Total Cholesterol, LDL and decrease in the HDL concentrations. They are independent predictors of type 2 diabetes mellitus . Overweight, obesity and physical inactivity along with Lifestyle and diet also will contribute for the disease [18,19]. With the economic development and globalization the dietary habits have changed in India. The more intakes of saturated fats, energy-dense foods and fast foods are responsible for the major cause of concern for diabetes among women. South Asian Indians due to their genotype are more prone to diabetes, especially Indians [20,21]. A subtle variation in the gene sequence is associated with an increased risk of developing diabetes and its related complications . The Fasting and Postprandial left over blood samples were collected from 180 subjects (96 females and 84 males were considered for the study) of the 200 enrolled subjects visiting diagnostic centers for routine biochemical examination .The people suffering from infectious diseases were excluded from the study. They were aged between 15-85 years. The samples were collected after taking their written consent. Out of these 90 were diabetic cases (54 females and 36 males) and 90 were normal subjects. The samples were collected in EDTA and non-EDTA vials as per protocol . For the SNP study Only 41 diabetic cases (28 females and 13 males) 10 normal samples were processed by modified Sambrook protocol for DNA extraction and purification [24,25]. The Blood glucose levels were measured using Glucose oxidase peroxidase method for the 90 diabetic cases (54 females and 36 males) and 90 controls (42 females and 48 males) Their concentrations of lipids Total Cholesterol, Triglycerides, Low Density Lipoproteins (LDL) and High density Lipoproteins (HDL) were also analyzed and measured using Star 21 plus auto-analyzer . The SNPs rs2975760 and rs3792267  in CAPN10 gene and rs rs3774261  in ADIPOQ gene for were selected for their validation in 41 subjects of which 28 females and 13 males of our study population and 10 controls [27,28]. The Biochemical parameters of the women study participants were compared to the men .The data for different parameters are presented in the Table 1 shown below as mean ± standard deviation .The subjects of the study were established as diabetic cases based on their biochemical reports which showed FBG of value more than 126 mg/dl or ≥ 7.0 mmol/l and PPBG of value more than 200 mg/dl or ≥ 11.1 mmol/l in accordance to WHO diagnostic criteria for diabetes. Table 1: Lipid profile characteristics of the study population. CAPN10 gene, rs2975760 with nucleotide change from C→T with corresponding amino acid change from Ala→Val was observed in 14 diabetic women cases and rs3792267 the nucleotide change G→A with corresponding amino acid change from Val→Ile in 15 diabetic women cases. The nucleotide change and corresponding amino acid change in the ADIPOQ gene is A→G (Met→Ile) for SNP rs3774261 is noticed in 11 women T2DM cases. The nucleotide change from A→G and the corresponding amino acid change from Arg→Gly identified in a new position were observed in 10 women diabetic cases of T2DM. CAPN10 gene SNPs are not present in controls . All the three SNPs are present in 6 of the women T2DM cases. The BOX SHADE (Figure 1) of the amplified gene shows the presence of SNPs along with the SNPs in new position (Tables 1-3). 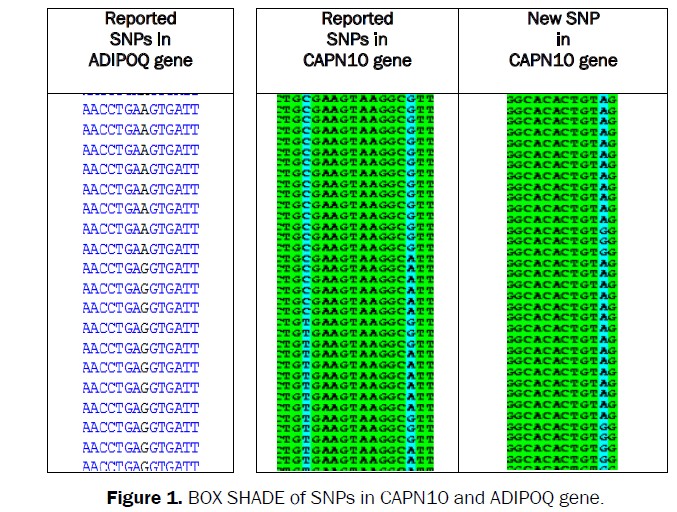 Figure 1: BOX SHADE of SNPs in CAPN10 and ADIPOQ gene. Table 2: Comparison of distribution of FBG and PPBG among women and men. Table 3: Distribution of SNP among diabetic women and men. Results of the blood sugar profile showed increased mean value of fasting blood Glucose (FBG) levels in controls and Post Prandial Blood Glucose (PPBG) in the study. For diabetic women cases FBG was 165.2 ± 57.4 and 134.2 ± 40.2 and PPBG was 241.3 ± 76 and 211.13 ± 57.4 (Table 2). FBG and PPBG were slightly higher in women in comparison to men. Results of Lipid Profile showed the increased value and were almost similar to men. Thea over all mean ± Standard deviation for women and men diabetic population is TC=176.8 ± 50.3, TG=198.1 ± 87.7, HDL=42.5 ± 4.7, LDL=86.4 ± 25.8, VLDL=41.8 ± 20.7 as shown in Table 1. The SNP rs3774261 of ADIPOQ gene is present in 42.8% of the women population and whereas this SNP is present in 38.4% of diabetic men.The SNP rs2975760 of CAPN 10 gene is present in 50% of the diabetic women studied where as it is present in 46.1% of the diabetic men. Similarly the SNP rs3792267 of CAPN 10 gene is present in 58.5% of the diabetic women population whereas this SNP is present in 30.7% of diabetic men. A new SNP was identified in new position of CAPN 10 gene and was found in 39.2% of diabetic women whereas it was found in 15.3% of the men population. The distribution of SNP in the study population is shown in Table 3. Globally the prevalence of diabetes in woman is increasing at an alarming rate . The prevalence studies of diabetes among woman showed varying results. Diabetes affects women's health across the life stages. The prevalence of diabetes was more in woman was more in Nepal and Sri Lankan woman . The number of American women diagnosed with diabetes is expected to reach 27.5 million by 2050 . India is having the second highest number of known diabetic cases worldwide . GDM prevalence is 3.8 to 21% in different parts of India [38,39]. In the case control study among the 180 subjects 90 were diabetic cases and 90 were controls, the females and males were 96 and 84 respectively. The number of women in our discrete diabetic population was more owing to increase in the number of women diabetics. The obesity among the woman is responsible for diabetes in diabetic cases and is a risk factor in controls; the lipid abnormalities are the risk factors for cardiovascular disease in diabetic cases and are risk factor for diabetes in controls. Hu FB. Globalization of Diabetes: The role of diet, lifestyle and genes. Diabetes Care. 2011;34:1249-1257. O’Doherty R, et al. Insulin resistance. Diabetologia. 1997;40:B10-15. Lillioja S, et al. Insulin resistance and insulin secretory dysfunction as precursors of non-insulin dependent diabetes mellitus. Prospective studies of Pima Indians. N Engl JMed. 1993;329:1988-1992. Temple RC, et al. Insulin deficiency in non-insulin-dependent diabetes. Lancet. 1989;1:293-295. Wild S, et al. Global prevalence of diabetes: Estimates for the year 2000 and projections for 2030. Diabetes Care. 2004;27:1047-1053. Cheekurthy AJ, et al. Predisposition factors of type ii diabetes mellitus and related complications. Biotechnology and Bioforensics. 2015;43-50. Geiss LS, et al. Prevalence of diabetes among Native Americans and Alaska Natives, 1990–1997: an increasing burden. Diabetes Care. 2000;23:1786-1790. Bennett PH, et al. Diabetes mellitus in American (Pima) Indians. 1971;2:125-128. Will JC, et al. Diabetes mellitus among Navajo Indians: Findings from the Navajo Health and Nutrition Survey. J Nutr. 1997;127:2106S-2113S. Lee ET, et al. Diabetes and impaired glucose tolerance in three American Indian populations aged 45–74 years: the Strong Heart Study. Diabetes Care. 1995;18:599-610. Centers for Disease Control and Prevention National Diabetes Fact Sheet: National estimates and general information on diabetes and pre-diabetes in the United States. Department of Health and Human Service, Atlanta, GA. 2011. Bajaj S, et al. South Asian women with diabetes: Psychosocial challenges and management: Consensus statement. Indian J Endocr Metab. 2013;17:548-562. Bitzur R, et al. Triglycerides and HDL Cholesterol Stars or second leads in diabetes? Robert H and Eckel. Obesity and Type 2 Diabetes: What can be unified and what needs to be individualized? Diabetes Care. 2011;34:1424-1430. Admiraal WM, et al. The association of physical inactivity with type 2 diabetes among different ethnic groups. Diabet Med. 2011;28:668-672. Gujral UP, et al. Type 2 diabetes in South Asians: Similarities and differences with white Caucasian and other populations. Annals of the New York Academy of Sciences. 2013;1281:51-63. Mohan V. Why are Indians more prone to diabetes? J Assoc Physicians India. 2004;52:468-474. Cheekurthy AJ. Gene as a risk factor for type 2 diabetes mellitus and its related complications, Biomed Res Clin Prac. 2016;1:14-17. Banfi G, et al. The role of ethylenediamine tetraacetic acid (EDTA) as in vitro anticoagulant for diagnostic purposes. Clin Chem Lab Med. 2007;45:565-576. Sambrook J, Green MR Molecular Cloning: A Laboratory Manual, Cold Spring Harbor Laboratory Press, New York. 1989. Subbarayan PR, et al. Isolation of genomic DNA from human whole blood. Biotechniques. 2002;33:1231-1234. Huggett AS and Nixon DA. Use of glucose oxidase, peroxidase and O-dianisidine in determination of blood and urinary glucose. Lancet. 1957;273:368-370. Bodhini D, et al. Association of calpain 10 gene polymorphisms with type 2 diabetes mellitus in Southern Indians. Metabolism. 2011;60:681-688. Kommoju UJ, et al. Association of IRS, CAPN10 and PPARG gene polymorphisms with type 2 diabetes mellitus in the high-risk population of Hyderabad, India. J Diabetes. 2014;6:564-573. Ramya K, et al. Genetic association of ADIPOQ gene variants with type 2 diabetes, obesity and serum adiponectin levels in south Indian population. Gene. 2013;532:253-262. Mullis KB and Faloona FA. Specific synthesis of DNA in vitro via a polymerase-catalyzed chain reaction. Methods Enzymol. 1987;155:335-350. Mullis KB. The unusual origin of the polymerase chain reaction. Sci Am. 1990;262:64-65. Stellwagen NC. Electrophoresis of DNA in agarose gels, polyacrylamide gels and in free solution. Electrophoresis. 2009;30:S188-195. Johnson PH and Grossman LI. Electrophoresis of DNA in agarose gels. Optimizing separations of conformational isomers of double- and single stranded DNAs. Biochemistry. 1997;16:4217-4225. Cheekurhty AJP, et al. Association of new single nucleotide polymorphism with type 2 diabetes mellitus. J Diabetes Metab. 2015;6:530. Hu J. Women and Diabetes: A global perspective. J Women Health, Issues Care. 2013;2:1. Ono K, et al. The prevalence of type 2 diabetes mellitus and impaired fasting glucose in semi-urban population of Nepal. Nepal Med Coll J. 2007;9:154–156. Katulanda P, et al. Prevalence and projections of diabetes and pre-diabetes in adults in Sri Lanka--Sri Lanka Diabetes, Cardiovascular Study (SLDCS) Diabet Med. 2008;25:1062–1069. AHRQ. Women at high risk for diabetes: Access and quality of health care, 2003-2006. US Department of Health & Human Services, Rockville, Maryland. 2011. Seshiah V, et al. Gestational diabetes mellitus--Indian guidelines. Indian Med Assoc. 2009; 107:799-802,804-806.